While we watched the political commentary on the Montana primaries last Tuesday, the Handyman and I decided to enjoy mojitos made from the mint in our community garden. The mint's taken over it's own corner, so there was plenty for steeping in the syrup and for crushing in the glass. 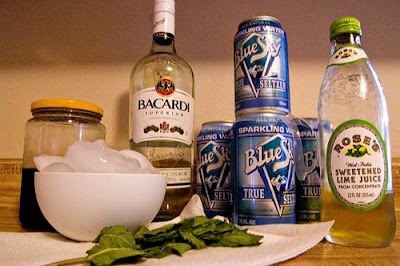 I have absolutely no opinion about light rum versus gold, and I have no advice on "muddling" the flavors and mint in the bottom of the glass. But, what I managed to put together tasted delicious - and if you leave out the rum, it's a fun homemade soda for kids. Head to http://www.mywhimislaw.com/?p=1388 for the recipe and all kinds of yummy tips. Now we're talkin'! Yeah for mojitos! .....when we're not drinking wine, of course.